The tenth annual Hay Raze was held in Lake Henry on Saturday, June 11. Bingo, children¹s games, old-time music, and a dance with DiamondBack were held in addition to the competitive events: the kiddie parade, Little League tournament, volleyball tournament, lawn tractor pull, and Hay Raze Olympics. The tenth annual Hay Raze was held in Lake Henry on Saturday, June 11. Bingo, children's games, old-time music, and a dance with DiamondBack were held in addition to the competitive events. 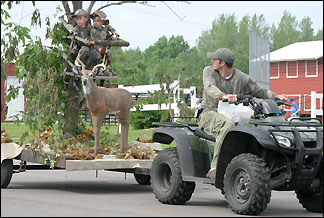 Levi and Cooper Bast, dressed as hunters and riding in a tree stand, took first place. A dance to the song "I Like Big Butts" by Matthew, Natan, and Kaitlyn Spanier and Andrea and Erica Schlangen, came in second. Megan and Michael Ludwig, with Samantha and Cory Dahl, were third with a Mystery Machine. Looking over his shoulder, Steve Bast checked on his sons - Levi and Cooper Bast - during the kiddie parade, in which they took first place. The championship game of the Little League Tournament was called due to rain, so Greenwald and Lake Henry tied for first. Spring Hill was third and St. Martin came in forth. Four teams participated in a round robin volleyball tournament that was not completed due to rain. The lawn tractor pull competition was divided into three weights. In the 750 pound category, Dennis Roos, Kurt Frieler, and Dale Olmscheid, all of Lake Henry, placed in that order. The 950 pound division was won by Jeff Wenning of Albany, with Roos in second and Bill Hanse of Albany in third. Wenning also secured a victory in the 1150 pound competition. Joey Pelzer took second and Roos came in third in that category. 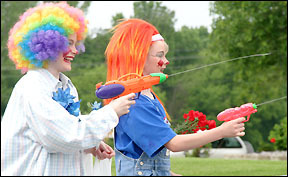 Squirting parade-goers was a highlight for Abby and Grace Hopfer, dressed as clowns in the parade. The Hay Raze Olympics - with five sporting events, an obstacle course, and some relays - was held in the afternoon, with four teams competing. Kamikaze, from Lake Henry, won the event, while the team Speckville from Richmond was second. Fodrizzle, also of Lake Henry, was third, with Slammers from Spring Hill coming in fourth.